Stonewall Jackson Lake State Park in Lewis County was an ambitious outdoor amenity project – consisting of campsite, marina and offices – that was completed in 1990 by the Army Corps of Engineers as part of flood control measures for the West Fork River. 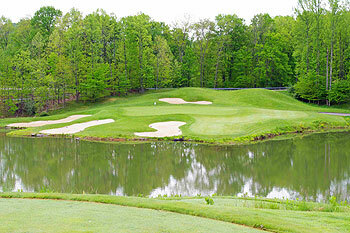 One of thirty six state parks in West Virginia, ten of which have golfing facilities, it was one of the first in the US to combine federal, state and private interests into one ownership body, using Benchmark Hospitality International to manage the park in its re-branded format as Stonewall Resort. As part of Stonewall’s multi-million dollar improvement program at the end of the 1990s, the resort acquired the talents of Eric Larsen, one of the most highly respected project architects at Arnold Palmer Design, to lay out a championship golf course within the property. The layout opened in the summer of 2002, quickly establishing itself as one of the best public access courses in the whole country. With fairways that play over water, cut across wetlands, weave through woodland and cling to the side of valleys, the course offers challenge and beauty in equal measure – and with no real estate development, it’s just golf and nature at one with each other. The downhill 166-yard, par three 6th is rated the easiest hole on the front nine but it’s also the most memorable, playing across part of the lake with a carry of around a hundred yards to a highly contoured green. The 455-yard, par four 17th may be remembered for a different reason as the large, dead tree that sits in the centre of marshland between the fairway and green divides opinion on its strategic merit. The most challenging hole is the 17th. Driving distance is somewhat limited as the fairway ends at an area of wetland. The carry across the wetland area to the green is about 165 yards. The left side of the fairway is protected by a large tree in the wetlands area so the tee shot must be fairly precise in the middle to right side of fairway. Too far right is a lateral hazard. The putting surface is protected at the front left by a bunker with bunkers long and to the right. The green is kidney shaped and slopes from front to back and right to left. Par is a very good score here and bogey is acceptable! As far as a “signature hole” on the course is concerned, we have around a dozen that could qualify. Hole 6 is the recognized signature hole, a par three across Stonewall Jackson Lake that is well protected in front by bunkers with a green divided into four quadrants by small ridges. The par five 7th is a very pretty hole, framed by tall trees and, from 130 yards in, is lined by bunkers that shape the fairway. Hole 12 is a par five with a split fairway in the landing area for the second shot which then plays up a valley to a tiny elevated green. Hole 17 would also qualify as described above!